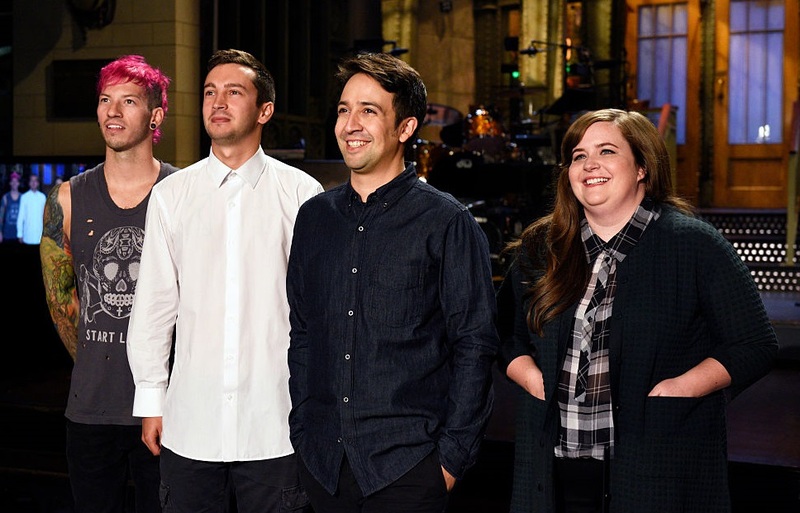 Without a doubt, Lin-Manuel Miranda rocked it on Saturday Night Live this weekend. He pretty much had a chance to showcase everything — his acting skills, his rapping skills, and his ability to handle live performances naturally and with a sense of humor. So, it’s neat that he also showcased his ability to flawlessly share the experience with his fans. Tweets from Miranda’s account went live on Sunday afternoon, likely after he recovered from the show. Here’s what we learned. First, a view of the head honchos. You just can’t have a show without Lorne. Next, Miranda revealed how he (adorably) prepped for the live event. He’s looking as dashing as ever! Then, it’s time for his “is this really happening?” moment. At one point I turned a corner backstage and @SteveMartinToGo and @jimmyfallon were chillin'. I was like "I FOUND THE 5-TIMERS' CLUB." We get Jimmy Fallon (especially since he had a cameo appearance) but — is anyone else loving the fact that Steve Martin seemingly just hangs out around the studio? Of course, selfies had to happen. Miranda joked in his monologue that this would likely be his only hosting opportunity (at least for a bunch of years) so, while we disagree, we respect the fact that he wanted photos to remember the big day. And now, some props from a cut sketch! Based on time and audience reaction during the dress rehearsal, some sketches don’t make it live. Sometimes they find life online as an exclusive clip. Whatever this was, let’s hope we’ll see it again. Here’s a behind the scenes look at those cool bumper shots. This kind of makes us feel like we’re right there with him! Many congratulations again to the multi-talented Lin-Manuel Miranda for doing such a great job on Saturday!